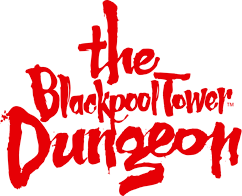 The Blackpool Tower Dungeon brings together an amazing cast of theatrical actors, special effects, stages, scenes and a ride in a truly unique and exciting walk through experience. With a full cast of brilliant actors, 10 shows, rich sets, special effects and an exciting drop ride, it's a 60 minute journey through 1000 years of Lancashire’s murky past. You and your companions walk through the Dungeon, moving from show to show, guided by our professional, theatrical actors.